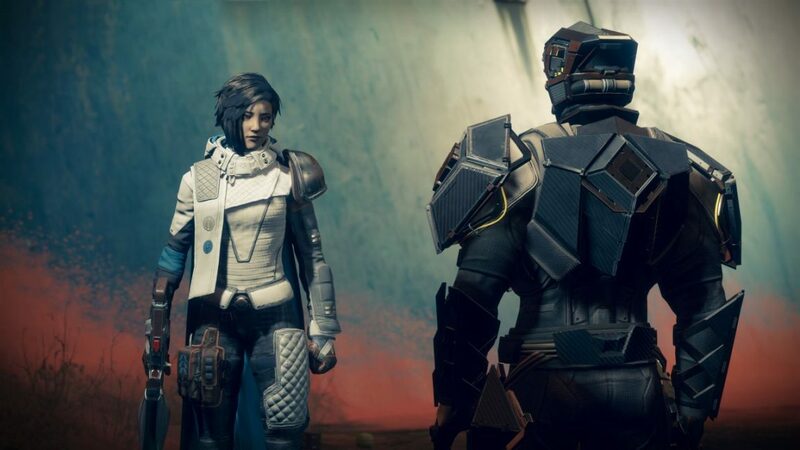 Destiny 2 Mars Token aren't exactly the easiest items to earn in Bungie's FPS, and you're going to need to earn a fair few tokens if you want to bag some elusive gear items from Ana Bray. 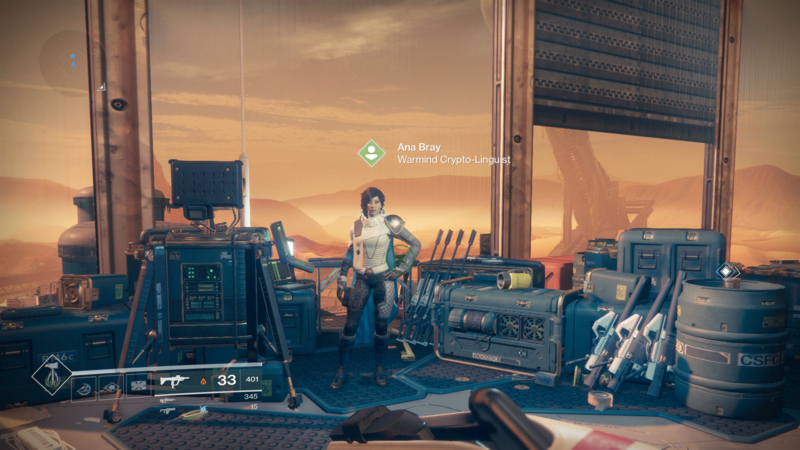 In this Destiny 2 Mars Tokens guide, we'll be walking you through how to earn Destiny 2 Mars Tokens quickly, so you can bring all the required Token amounts back to Ana Bray, and cash them all in for some rewards. If you instead need anything else on the new Warmind DLC expansion for Destiny 2, including how to unlock all the brand new content in the next chapter in the Destiny saga, or how to guide yourself through the opening story missions, make sure to head over to our Destiny 2 Warmind guides hub. Firstly, it goes without saying that you’ll have to unlock the planet of Mars in order to begin earning Mars Tokens. For this you’ll have to both purchase the new Warmind expansion for Destiny 2 (retailing at $19.99), and you’ll then have to complete the opening two story missions of the new expansion, which have a recommended Power Level requirement of 310. Once you’re through the opening story missions (which take around 15 minutes a piece), you’ll have access to the brand new Hellas Basin area on Mars, which Ana Bray calls home. 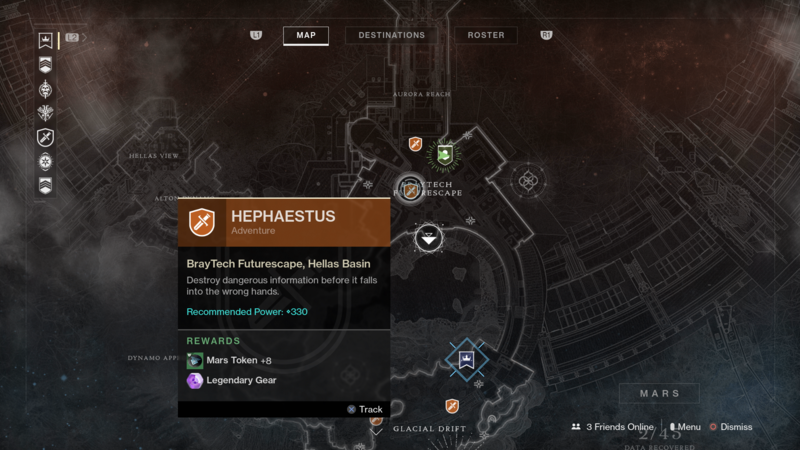 You can now head over to Bray within the northern part of the map, to either undertake various Warmind-centric story missions, or browse her range of items. 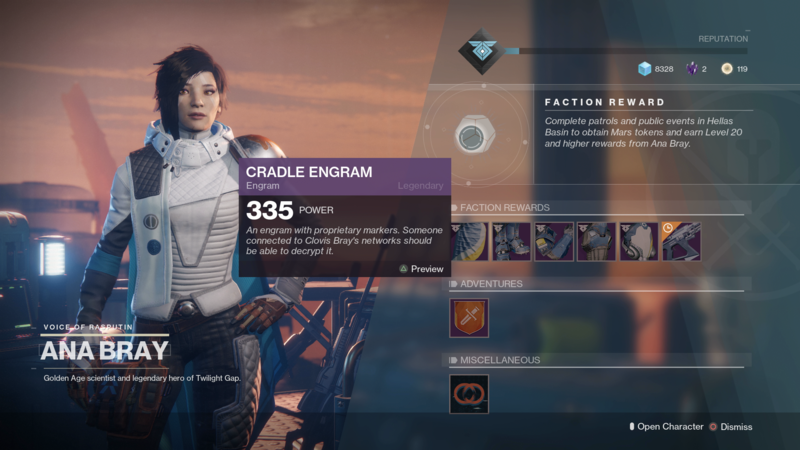 Thanks to Bungie doing some work behind the scenes to make it easier for Guardians to level up their Power Level quickly, the Cradle Engram grants items at a boosted level of 335 to start. So, how can you go about earning Mars Tokens quickly? There are a few simply methods: grind either the Escalation Protocol horde mode, missions for Ana Bray, or Adventure missions on Mars. You’ll earn 8 Mars Tokens for completing the Data Recovery quest for Ana as well as for each Adventure, meaning they’re not actually incredibly hard to earn. You’ll see that Mars Tokens are also needed to earn a single Cradle Engram, and we’d estimate the new Engram requiring roughly 20 Mars Tokens in order to unlock. These new Cradle Emblems can contain any of the new Warmind gear (for a complete list of the new elite items, head over to our Warmind Exotics guide), as well as any of the Faction Rewards that you can see just below. Check the Faction Reward items in Ana's inventory, and you’ll see that they not only require Mars Tokens and Legendary Shards to earn, but they also require you to have earned a certain amount of Cradle Engrams to unlock, increasing in increments of 2, from 2 Emblems to a maximum of 10. We might be all wrapped up with this Destiny 2 guide on how to earn Mars Tokens fairly quickly, but continue ahead to our complete Insight Terminus Strike walkthrough, or our Escalation Protocol guide.